I think this chocolate contains the velvetiest ganache I ever made, thanks to the addition of pumpkin. It is positively silky. 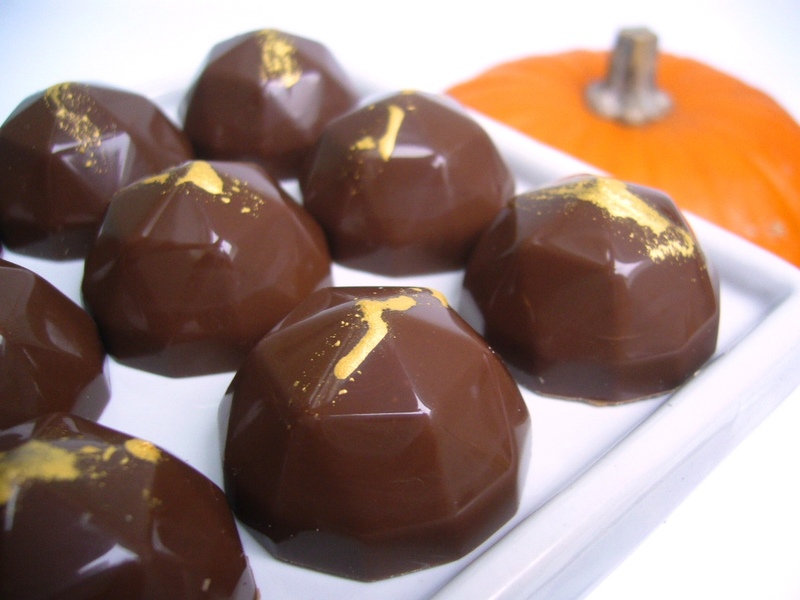 A milk chocolate shell burnished with gold contains a caramelised pumpkin ganache, lightly spiced with a sprinkling of nutmeg, cinnamon and ginger. Pumpkin is a subtle flavour, but it lends an autumnal character and the aforementioned silkiness. So soft and pillowy. Mm-mm. Crunchy leaves of green, gold and auburn, a crisp freshness in the air, scarves and woolly socks, and of course pumpkins – autumn is here! This seasonal delight is available in our mixed selection box for a short time only until stocks run out. Enjoy!